Come on in, my cabin is always open for friends. We have fresh game and poultry to eat, along with some fresh vegetables that we grew ourselves. Glad you brought your rifle, you might need it out here in the wilderness. Never know when them savages might appear. Been having problems with the natives the last few weeks. Never know when a war party can be in the area. I never go anywhere without my trusty rifle. I keep myself fed and clothed by selling these hides I take during the winter. I deal with all sorts of buyers, so I have no quarrels with French, British, or Indian. Whoever has the silver is who I sell to. Primitive Artisans: A good supplier of wampum and beaded items. Wishbone's Fire Pit: A good friend and good web site. Trekking in the Wilderness: A good trekking web page. The Historical Trek: A good trekker web page. Smoke and Fire Web Page: A good monthly newspaper and event schedule list, plus a seller of good period correct wares. Scott Allen's Longhunter's Basecamp: A good scout and a good representative for Fort Fredrick. French and Indian War Magazine: A good online magazine for the F&I War. Crooked Hand's Powder Horn Page: A great source for authentic powder horns and accessories. Swamp Fox Knives : A great source for authentic knives . 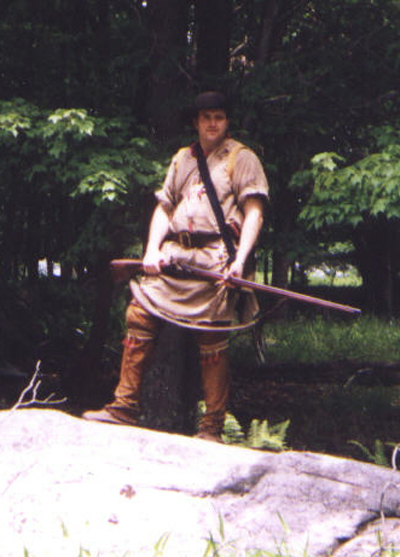 The Kittanning Expedition :Hard work that my friend Lane Savage put into a 126 mile historical trek. Great Site!